This week, the Court of Appeal has handed down judgment in the case of Williams v The Secretary of State for Business, Energy & Industrial Strategy  EWCA Civ 852. This considered the costs consequences of Part 36 Offer acceptance in a case which could have been commenced through the Pre-Action Protocol (PAP) and composite Portal. The claimant was employed by the National Coal Board (NCB) and British Tissues and was exposed to a ‘history of unprotected noise exposure of high level and long duration’. The claimant worked at the NCB between 1977 and 1991. Then, between 1991 and 1993 and 1997 and 2008, the claimant worked at British Tissues. The NCB’s liabilities were subsequently devolved to the defendant. 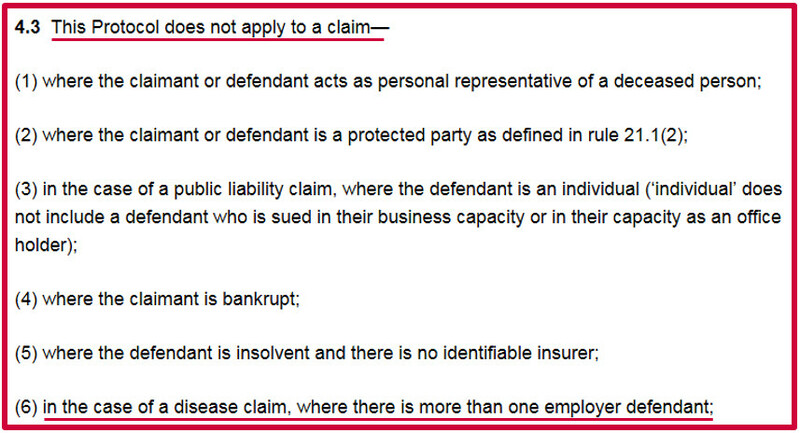 As a result of noise exposure, the claimant was diagnosed with NIHL. Medical evidence showed that the claimant had ‘more likely than not sustained hearing loss in the order of 12 dB over and above the hearing loss expected for someone of this age’. In December of 2013 and February of 2014, Letters of Claim were sent to British Tissues and the defendant, respectively. The claimant did not seek to pursue the claim under the Pre-Action Protocol for Low Value Personal Injury (Employers’ Liability and Public Liability) Claims and the EL/PL Portal, as this was not a single defendant claim. ‘If this claim is not submitted through the Claims Portal and the claim is ultimately settled against our Client alone, the Defendant will seek an order from the Court for fixed costs to be applied under CPR Part 45.24’. ‘… as we have previously advised you we are pursuing a claim against British Tissues who have confirmed that they're on cover’. In May of 2014, British Tissues disclosed the claimant’s employment contract, which identified a mandatory condition of his employment to wear personal hearing protection. Further, certificates were disclosed, which showed that the claimant had completed a Working Safely course, while also disclosing details of a formal disciplinary hearing for the claimant’s failure to follow Health and Safety Procedures. This contradicted the claimant’s witness statement, which made no mention of the disciplinary hearing and alleged that hearing protection ‘was not enforced’. As a result, in November of 2014, the claimant’s solicitors realised that they had no viable claim against British Tissues. The defendant’s solicitors were informed that the claim was now pursued ‘solely against yourselves’. Proceedings were now brought against a single defendant. Part 36 Offers of £4,000 and £2,000 were made by the defendant and claimant, respectively, before the defendant’s final Offer, of £2,500 was accepted by the claimant in December of 2014. Prior to acceptance, there had been no correspondence that the defendant was liable for limited EL/PL Portal fixed costs. In January of 2015, official confirmation was given that the defendant was the only party which legal action was being pursued against. The defendant argued that it was only liable for costs ordinarily due under the PAP as the exception to the EL/PL Portal no longer existed. The claim was valued at less than £25,000, there was a single defendant, and the claim was for an industrial disease [see Dalton v BT PLC  EWHC 616 (QB)]. At first instance, the Deputy District Judge took the view that the Protocol should have applied to this case. He highlighted that the Protocols are subject to the overriding objective and observed that it would be ‘unjust’ to require the defendant to pay ‘substantially more’ costs because the claim was made against another ‘potential defendant’, which ‘failed at the first hurdle’. ‘… it seems to me that to prevent abuse, however innocent, some sort of qualifying test for the validity of the claim against an alternative defendant employer must be considered. Whether that test is that the claim must be more than weak, reasonable, viable, compelling, or some other term, is not for me to say’. In doing so, the judge gave a purposive interpretation, qualifying the definition of ‘defendant’, for the purpose of paragraph 4.3(6) of the PAP. ‘... I think it must apply despite the fact that there have been no formal proceedings and no judgments ... The defendant appears to have acted properly and within the spirit of the protocol on what was achieved in this case was precisely what the protocol was set up to achieve by yearly settlement by way of negotiation and without the need for litigation. I cannot understand why the defendant should therefore be prejudiced in costs for settling a case reasonably, appropriately and at an early stage. To say otherwise would leave the parties in the ridiculous position in my view of having to say to each other proceedings have to be commenced before we can achieve a settlement because of the costs implications of that settlement. That would be perverse. ‘I cannot read CPR Part 45.24 as applying when express conditions are not met. It is even more difficult to do so when interpreting the terms of a contract. The claim was not brought within the protocol and there are no fixed costs. The claimant is entitled to costs to be assessed on the standard basis’. There were no Part 7 proceedings and there had been no judgment. Given the lack of satisfied pre-conditions, the judge was not able to apply CPR 45.24 to the facts. ‘An appropriate sum may well be fixed costs but that is a matter for the district judge. I offered to deal with the matter today but the parties concluded that this was not appropriate. The appeal is allowed and the matter is remitted to the district judge’. ‘... Neither the EL/PL Protocol nor r.45.24 provides a mechanism which automatically applies the fixed costs regime in circumstances where a claim has not been started under the Protocol and/or has not been the subject of a Part 7 claim and a judgment. There is no drafting error, obvious or otherwise, in the CPR. Although Judge Godsmark QC may have had Part 44 in mind, I would allow the appeal on the second ground. 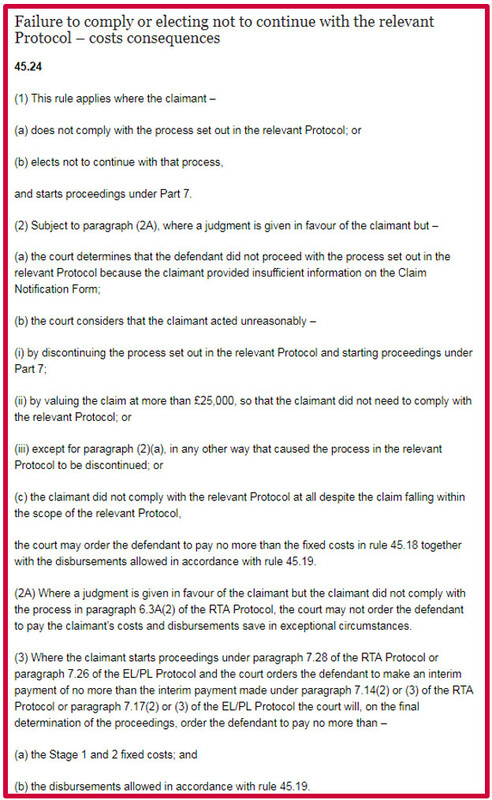 In a case where the Protocol should have been used, and its non-use was unreasonable then, pursuant to the Part 44 conduct provisions, the claimant will usually be entitled to recover only the fixed costs and the disbursements permitted by the Protocol’. Full text judgment can be found here.